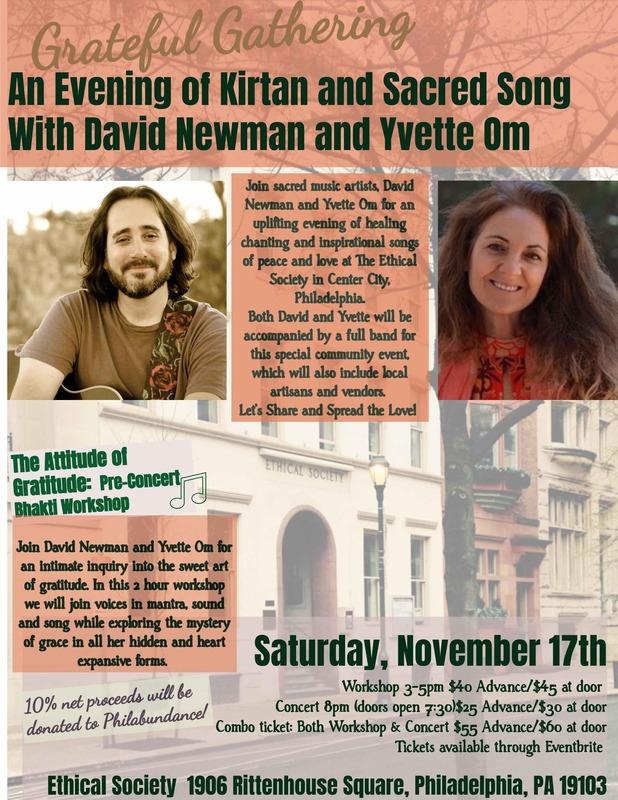 Join local sacred chant artists David Newman and Yvette Om in Philadelphia city center for a special collaboration featuring two full sets of ecstatic chanting and inspirational songs of peace and love. Both David and Yvette will be joined by a full band of gifted musicians for a deep and healing experience of music, mantras, dancing and singing from the heart. Join us to share and spread the love! Join both David Newman and Yvette Om for an intimate inquiry into the sweet art of gratitude. In this 2 hour workshop we will join voices in mantra, sound and song while exploring the mystery of grace in all her hidden and heart expansive forms. Workshop seating is limited, so purchase early. David Newman is a renowned sacred mantra artist, singer-songwriter, author, and inspirational teacher. David, also known as Durga Das, has released twelve acclaimed albums, including the #1 iTunes World Music Bestseller Love is Awake. David's music is a celebration of spirit diving deep into the power of mantra, and spreading conscious lyrics with a message of hopee, peace, and universal love.